Coming along nicely! Sort of… – Nice dress! Thanks, I made it!! There has been a lot of sitting around this weekend, watching movies and the drizzling rain, and snacking. Not really heavy rain, but that rain that makes you think “Do I need an umbrella or not?” I have been staring at my sewing projects too, perhaps waiting for them to magically put themselves together. That hasn’t happened yet. Let me tell you what I have accomplished this last week, on what I am now calling my “Two Jeans Project”, it all started with a Craftsy course instructed by Angela Wolf and Sandra Betzina’s Craftsy course and Vogue pattern V2948 which I posted about first here and here. The next steps I had to work on were the fly fronts. 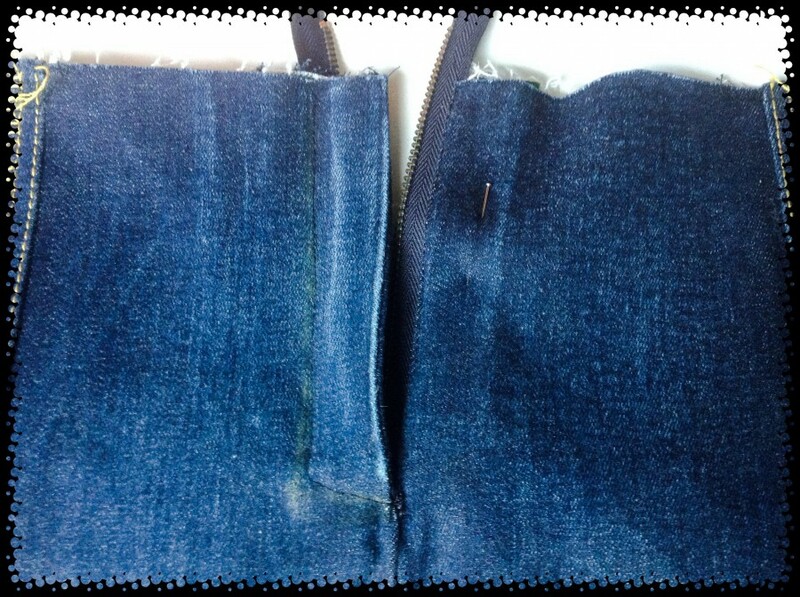 I prepared the single layer fly pieces and the double layer fly pieces for both my jeans. 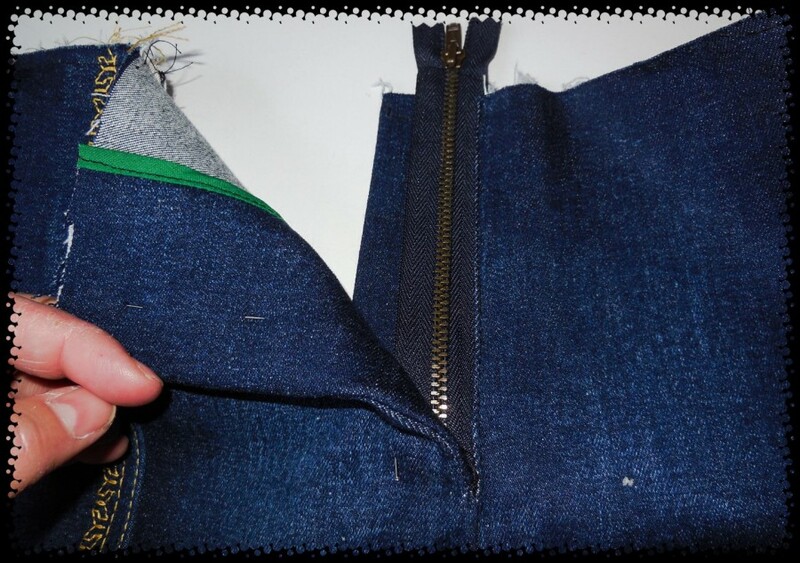 The zipper gets sewn on to the pants opening at the same time as the double fly piece. 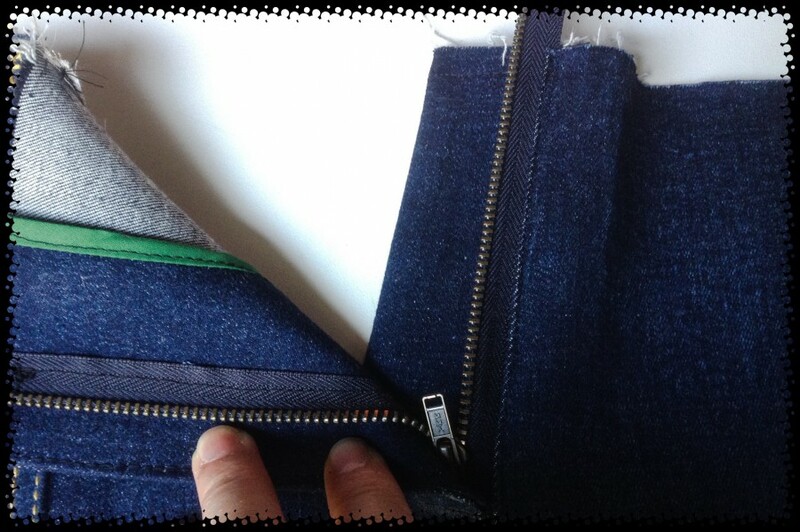 My single layer fly piece is sewn on the right side of the pants opening and folded under, pinned and pressed. 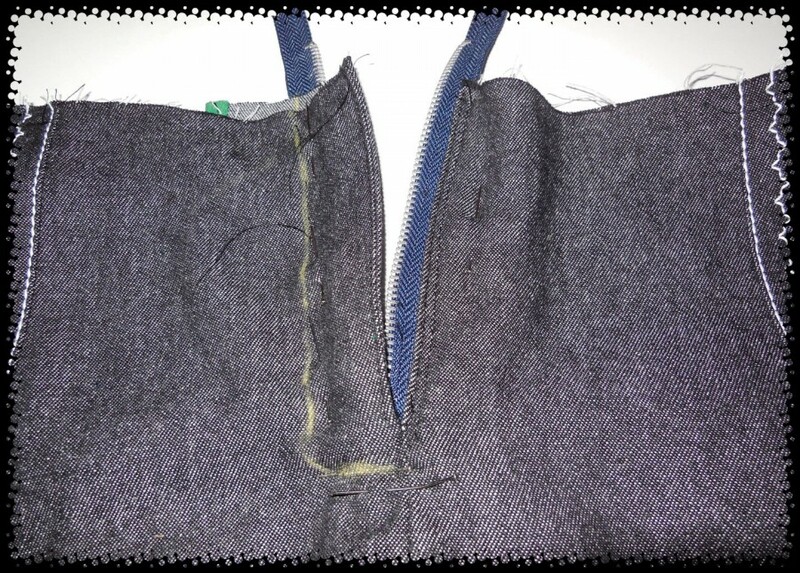 The zipper is closed and the right flap is placed over the left flap, matching centres, and then I sewed on the other zipper side through all the layers. Now one thing I try to remember and always forget when I sew down the other side of the zipper, through all the layers, I don’t really want to sew through my double layer fly piece. I pin it back. I try to remember, but I usually forget, and I end up with a fly that is sewn shut, through all the layers, which means ripping out my last stitches, and placing and pinning and sewing again. 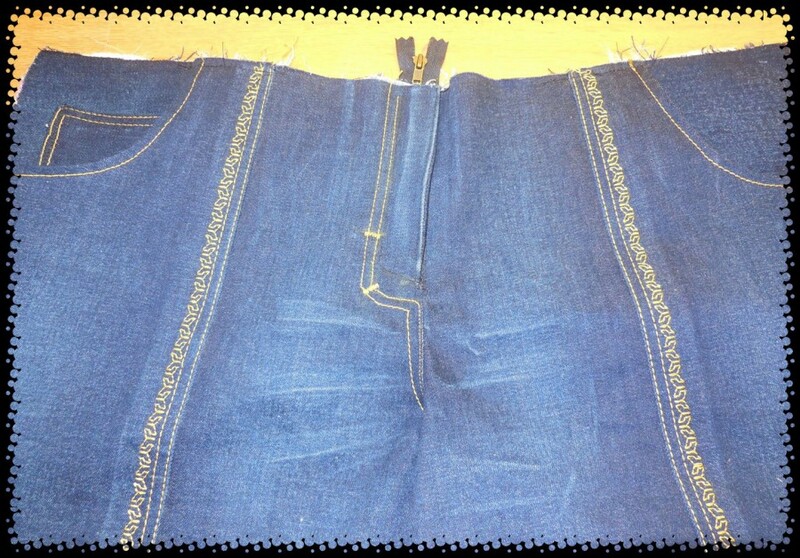 Finished fly front, distressing and topstitching on my blue cotton jeans. 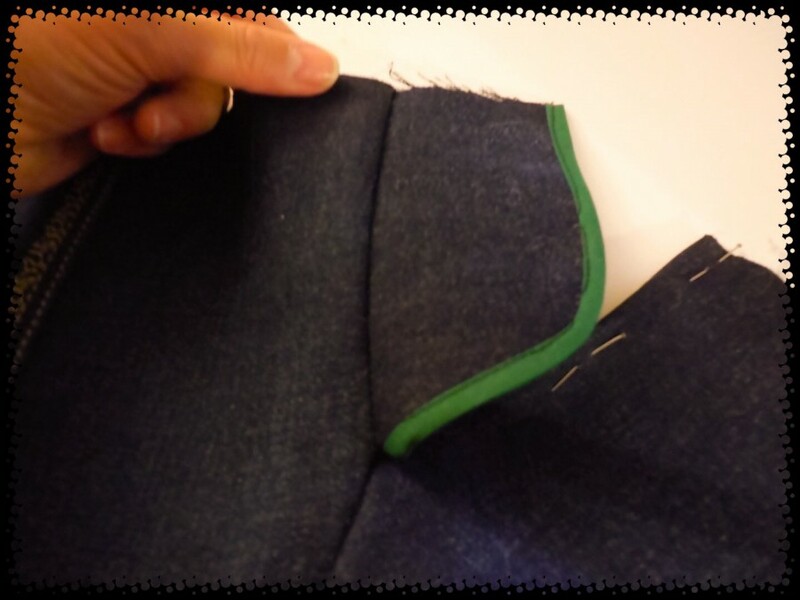 I just love the fold lines I distressed into the front of my jeans – so cool! All thanks to Angela Wolf! Before topstitching I did distress some more in the zipper area too. 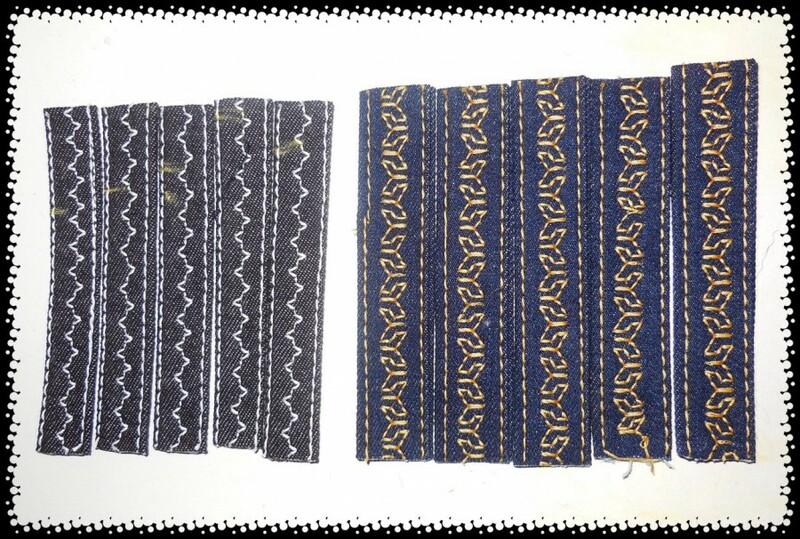 There was a bit of a problem because where I wanted to sew two rows of topstitching, I couldn’t, because one of the rows would have landed where the metal zipper stopper is. I ended up squeezing in a single row of dark stitching, to hold my zipper, above the zipper stopper, and a double row of fancy topstitching below the zipper stopper, just for decoration. You shouldn’t be looking there anyway! Finished fly front and topstitching on my black jeans. Again, one row of the double row of topstitching would have landed on my metal zipper stopper. I found a different solution for this pair by tapering the two topstitching rows into one at the bottom of the zipper, missing the stopper. Next time, I should remember to buy longer-than-suggested zippers. Then I made the belt carriers. Those were just as fun as the patch pockets! The instructions were to sew the right sides of one strip together and then turn it out. I don’t like turning skinny things inside out so I just folded the edges into the centre and then folded the whole strip in half. Pressing and sewing finished them off. Next the inseams were sewn, distressed, and topstitched, and the outer seams were basted. Now I have to try on both pairs for final fitting. 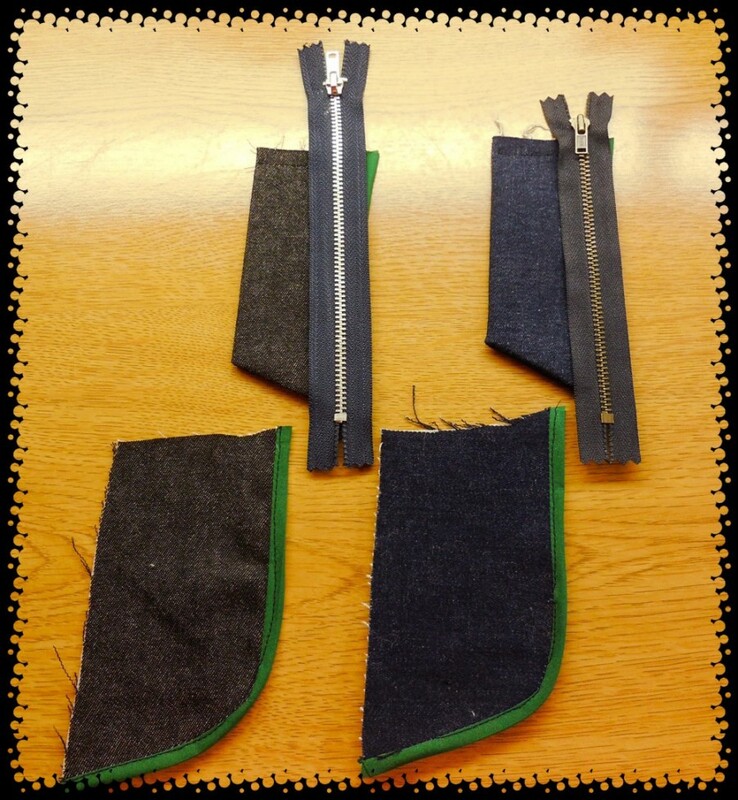 I am getting close to the Finish Line – all I need now is to check the fit, sew on the waistbands and sew up the hems! Whoo Hoo! Sitting here watching movies and the drizzling rain, and snacking, has made me wonder though… Are “Tim Tam chocolate cookies” made by Angels in Heaven? because they are divine! And why is the box so small? They’re coming along so well. I like the way you’ve divided it into achievable sections, too. This is what makes sewing so accessible – you don’t have to make the whole thing at once and be overwhelmed by the project. Of course, this also means you need to plan well in advance if you want a new garment. I can’t wait to see your jeans when they’re done! The belt carriers ( I just about called them belt loops) look cool. A very detailed and intricate project. The distressing looks like a lot of fun. Good job. Thanks! I’m looking forward to seeing your’s. Everyone does it differently, it’s great to see all the styles! Great photos of the fly construction. 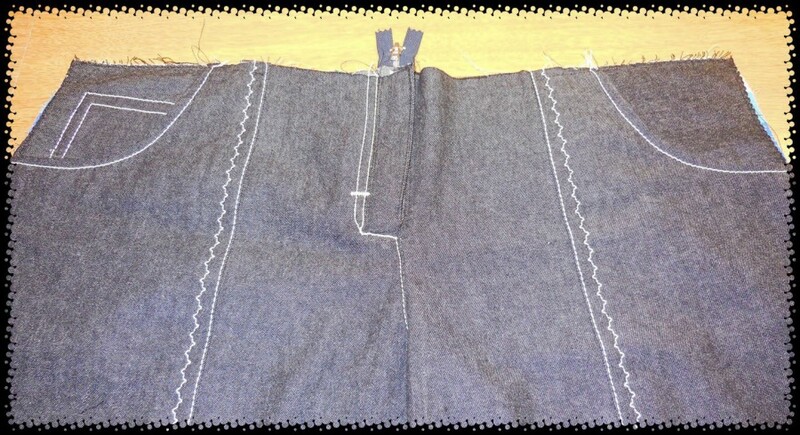 I’m also near the finishing line with my jeans….. Just need to add waistband, belt loops, button, rivets and hem. So far I’ve really enjoyed making them. I did the same thing with my fly topstitching, I taped the two lines into one at the bottom. I could have made my fly facing and zipper guard longer but I’ll know for next time. Oops! I forgot about the button and rivets! Still have to do those yet! Have you had to hammer any of your seams yet because they are too thick to go through your machine? No, I haven’t had to use a hammer! But then I haven’t flat felled any seams. I was going flat fell the back yoke and rise seams but then realized I would have been better having a 2cm seam allowance to play with. I made the decision to over lock instead – I had difficulties with this decision as I felt that my jeans were a bit of a fraud. Sounds silly but I can be a bit hard on myself! Ah well, we all try to get it done perfectly don’t we. I am sure they will look perfect anyway! Belt carriers look great! I can’t wait to see the finished results! I certainly wish I was brave enough to try to make pants for myself. I tried being a dress girl…cause quite frankly they are so much more easier to make and while I love dresses I feel more comfortable in pants but won’t go near them with a 10-foot pole! LOOKING AWESOME! Thank you very much! It is quite fun putting together all the bits and pieces and I seriously want to distress and topstitch everything in sight! Hopefully it all turns out well in the end!! I like the decorative belt carriers! I do too! You should try them. Quick and easy! I might just put some of those on the next pair of pants/trousers I make. There’s a thought! Lookin’ good! I love the distressing you did–once I attempt jeans, I’ll have to try that! Thanks! 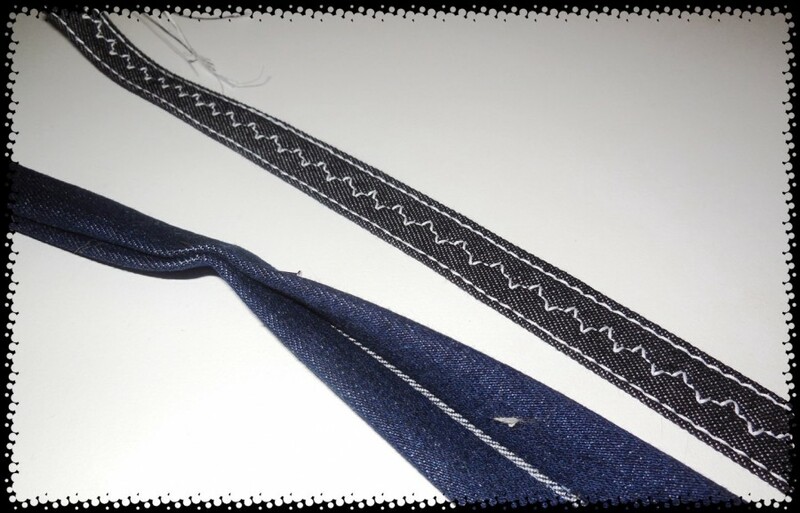 The distressing and the topstitching have been the fun – est parts of all! Thank you! I have certainly enjoyed doing this project! I’m very impressed with your zippers Linda. You’ll recall the zipper I put into my wedding dress eons ago. It was so awful Rose had to rip it out and start fresh. So all I can say is “zippers, no! 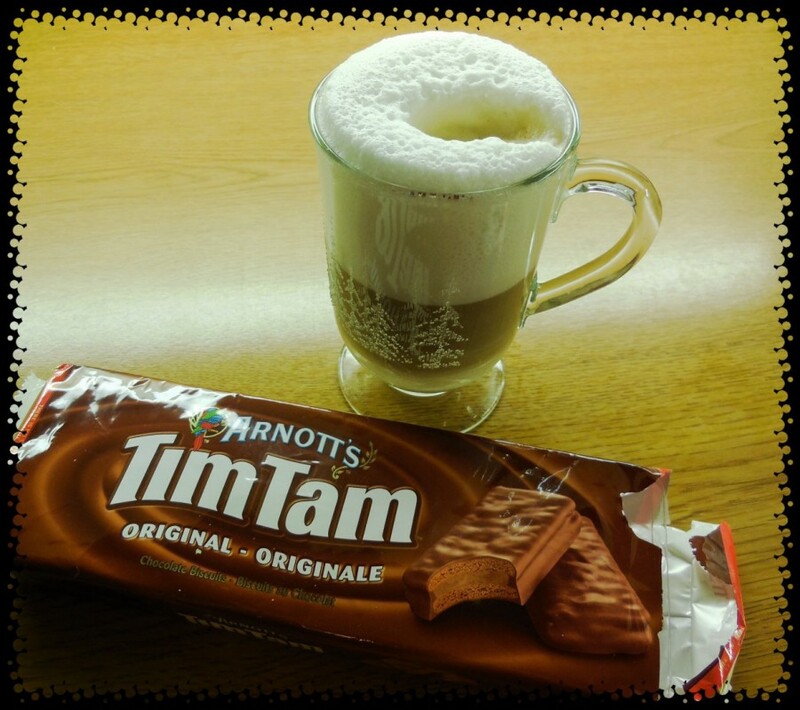 Tim Tams, yes!!! Thank you! Well if you ever need a zipper put in, I will do it for a box of Tim Tams!